Need Irvine bee removal services? The Bee Man is committed to keeping you and your family safe from any bee infestations that may occur. Bees definitely have favorite places to build hives (click here for a graphic). Above all, do not attempt to remove any beehives or swarms yourself because you will probably get stung. Call The Bee Man to remove your bee infestation the right way. The City of Irvine incorporated on December 28, 1971, and enjoys approximately 280 days of sunshine each year. As a result of the beautiful weather, bees swarms and infestations appear throughout the city. 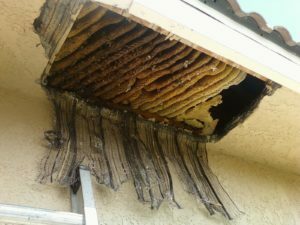 Many people do not realize the amount of property damage a beehive can do. An ideal place to build a hive is in a roof. The roof provides great protection from predators, easy access, and a constant temperature. Bees will find a small gap, usually 1/8 to 1/4 inch big, as an entry point. Usually, these access points are under tiles, around chimneys or under eaves. Once inside, bees will build their hive and fill up entire wall cavities with honeycomb. A mature hive can weigh over 100 pounds and emit odors that attract unwanted critters such as cockroaches, ants, mice, rats and other small animals. The best course of action is for the homeowner to remove the hive as soon as possible. Unfortunately, accessing the hive involves sawing through the wall or rooftop to access the hive. Once in, the hive must be removed and temporarily plugged to prevent future infestation. Another reason to remove the hive is to prevent any mold from growing and permeating the walls. The Bee Man offers professional Irvine bee removal services across all of Irvine. We advise all residents, whether they be in Northwood, Woodbridge, Deerfield, Quail Hill or the Turtle Rock area to not attempt to remove any bee infestations themselves. Furthermore, commercial clients in the Irvine Spectrum area should also be careful. If you see any bee infestations, be safe. Click here for our bee safety tips. Hence, if you need any Irvine bee removal, please contact The Bee Man at (949) 455-0123 before any property damage occurs.